New York jazz and folk musicians tackle Irish repertoire with Afro-Brazilian grooves and an explorative spirit. Part of what makes jazz a truly American art form is its ability to absorb and celebrate the musics of other cultures that wash up on its shores. 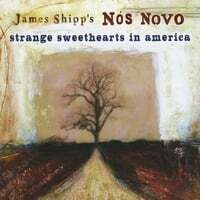 With their debut recording, vibraphonist/percussionist James Shipp and his band Nós Novo bring the songs and sounds of Ireland into the fold of New York’s jazz and creative music scene. James learned both tunes from his favorite album by the Chieftains, “Boil the Breakfast Early,” from which the air “Ag Taisteal na Blarnan” also came. Looking beyond the UK, Shipp and company bring their unique sound to Thelonious Monk’s music with an impressionistic, jig-based take on “I Mean You.” “Fold,” by singer-songwriter José González, takes on a tone that is both meditative and epic, aided by the presence of two pandeiros, a South-Indian drone box known as a shruti, a dangerously down-tuned guitar, and Lawry’s powerful vocal performance. Born in Columbia, Maryland, James Shipp moved to New York to study music, and has resided there ever since. James’ career is full of musics that inhabit multiple worlds. His earliest work of note as a sideman was with Tito Puente veteran trumpeter Ray Vega, with whom he played vjbes in Caribbean jazz quartets and quintets from 2002-2005. In 2006 he recorded with Vega and operatic soprano Sharon Spinetti, playing music by Debussy, Lara, and Villa-Lobos arranged by James for jazz quartet. In 2005 James began his musical relationship with Jo Lawry, the vocalist in Nós Novo. Her critically acclaimed 2008 release featured a number of his arrangements and compositions, along with his vibes, marimba, and percussion playing. 2008 also saw the release of Kate McGarry’s “If Less is More, Nothing is Everything” on Palmetto Records, which received a Grammy nomination for best album by a jazz vocalist. James lent his talents as both a percussionist and arranger to this album. Outside of the studio, James has enjoyed recent performances under the direction of up-and-coming Trinidiadian jazz trumpeter Etienne Charles, New York Voices vocalist Peter Eldridge, and tabla master Ustad Zakir Hussain, with whom he performed at Carnegie Hall in April 2009. Born on an almond farm in South Australia, vocalist Jo Lawry moved to New York as a Fulbright scholar in 2004. Since her arrival, she has played with a variety of artists including Jon Faddis, Donny McCaslin, Kate McGarry, and Peter Eldridge. In 2008 Jo joined legendary pianist Fred Hersch’s “Pocket Orchestra,” and recently performed on a number of concerts and a DVD with pop icon Sting. Jo’s folk music roots run deep; her Aunt Tina Lawton was recognized as one of Australia’s greatest folksingers in the late 1960s. Guitarist Keith Ganz has been performing and recording in New York for the last _ years. His ability to sound at home in any style has led to collaborations with Kate McGarry, Luciana Souza, MOSS, and Harry Connick, Jr.
Drummer/percussionist Rogério Boccato has been a top-call New York drummer and percussionist since moving to the area four years ago. He has appeared in performances and on recordings with saxophonist Kenny Garrett, bassist John Pattitucci, legendary Brazilian guitarist and singer Toninho Horta, and the Orquestra Jazz Sinfonica of São Paulo.